I often make soupe au pistou in summer. 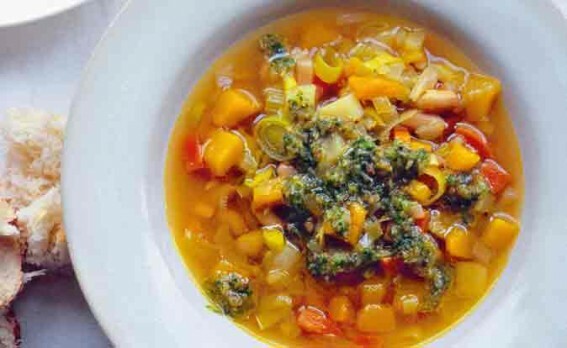 I missed it during autumn and winter, so I adapted it using cold weather vegetables and wintry pesto. Heat the oil in a large, heavy saucepan. Add the onion and carrot and sauté for 5 minutes. Add the other vegetables, season and sauté for 10 minutes. Pour in the stock and simmer for 5 minutes. Drain and rinse the beans. Add and cook for 5 minutes. To make the pesto put the nuts, garlic and parsley into a food processor with seasoning and half the oil. Pulse-blend, then stir in the remaining oil and the Parmesan. Top the soup with spoonfuls of pesto, serving the rest alongside. Parsley and walnut pesto is great with spaghetti (add chunks of ricotta to make it go further). It’s also good with pasta, goat’s cheese and fried radicchio.Parsley and walnut pesto is great with spaghetti (add chunks of ricotta to make it go further). It’s also good with pasta, goat’s cheese and fried radicchio.Parsley and walnut pesto is great with spaghetti (add chunks of ricotta to make it go further). It’s also good with pasta, goat’s cheese and fried radicchio. Parsley and walnut pesto is great with spaghetti (add chunks of ricotta to make it go further). It’s also good with pasta, goat’s cheese and fried radicchio.